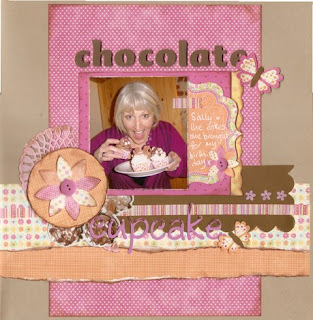 This page was made using mostly freebie papers from Scrapbook Magazine issue 64. This time they were HOTP Serendipity and I really enjoyed using them. The layout is from a sketch by Melanie Joyce in Scrapbook Magazine - I've followed it almost exactly for a change! As it happened, Sally conveniently dressed to match these papers when I took this photo on my 51st birthday in March this year - how fortuitous!